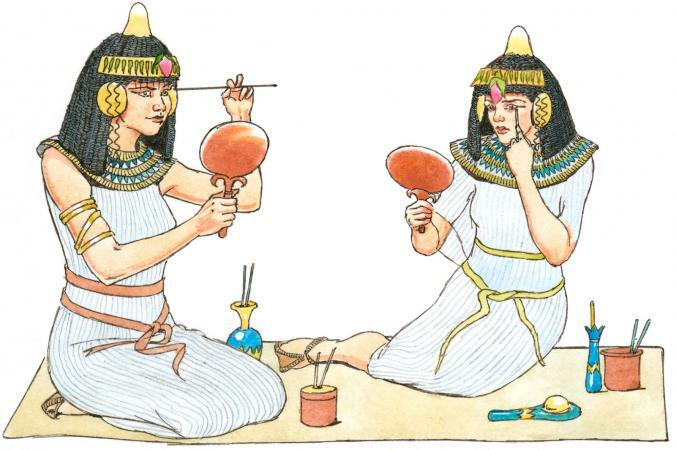 The history of makeup in Egypt demonstrates just how long cosmetics have been around. If you've ever seen Egyptian art, you've no doubt noticed the dramatic eye makeup present on men and women. 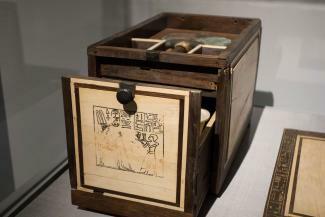 Ancient Egyptians of both genders routinely wore makeup and other cosmetic aids, such as perfume. They took great pride in their appearance and sought to enhance their looks with makeup. Ancient people had to work with what was available in their environment. Egyptians turned to the natural resources surrounding them to create cosmetics. Once ingredients were gathered, time-consuming preparation was needed to make them ready to apply. Minerals were ground into powder and then mixed with a carrier agent (often animal fat) in order to make it easy to apply and stay on the skin. Egyptians mostly used galena (more commonly known as kohl) and malachite powder (a green mineral) for eye makeup. Galena was a black paint that shielded eyes from the sun, while malachite powder made the eyes appear larger and protected those who wore it. Both were applied using ivory, wood, or sticks made of metal. Black was mostly used around the eyes and an almond or feline-inspired shape was the norm. However, the galena could also be applied to the eyebrows and eyelashes for added definition. Green pigment was placed all over the eyelid and underneath the brow bone. Though styles varied as time went on, black and green were staples of beauty in ancient Egypt. Cosmetic reasons played a large role in the daily application of eye makeup, but it was also used for health and protection. Both men and women participated in this elaborate ritual for a variety of reasons, such as a way to imitate the gods, to protect the skin from the sun (kohl was believed to repel flies and ward off infections, among other things), and offer protection against evil (eyes without makeup were thought to be vulnerable to the Evil Eye). As a result, makeup became a source of personal power. The most obvious way to differentiate the upper class from the poor was to look at their applicators and storage. While everyone had access to the products used to decorate the skin, poorer people relied on clay pots and sticks. Those with money had ivory containers and applicators that were beautifully carved and bejeweled. Though the eyes had the highest importance, men and women drew attention to the lips as well. This was typically done with the use of red ocher. It was often applied alone but in many cases was mixed with resin or gum for a longer lasting appearance. According to a Harvard paper on the history of lipstick, popular color choices included red, orange, magenta, and blue-black. Cleopatra wore a unique red lipstick created from flowers, red ochre, fish scales, crushed ants, carmine, and beeswax. Her signature shade made red a popular choice, and as a result, the use of carmine became more widespread. Ingredients were mixed in either brass or wooden bowls (depending on class levels) and once the color had been created it could be applied directly onto the lips. This was done using wet wooden sticks that acted as an applicator brush. There were many cosmetic reasons the Egyptians chose to accentuate the mouth. Not only did the bold colors draw attention to this area but application had ties to social standing. According to beauty historian Rachel Weingarten in a Bustle article on lipstick, members of royalty and the upper class wore lip paints to showcase their status in society. It became a symbol of sophistication and importance, rather than just a beauty item. Though poorer men and women also wore handmade lipsticks, it was largely regarded as something for the upper class. This is why well-off women were often buried with two or more pots of lip paint. 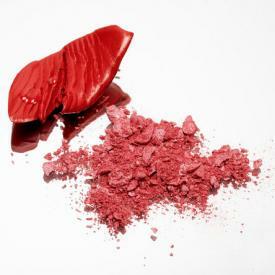 Much like paints for the lips, red ocher was commonly used to add color to the cheeks. The process of creating this blush started with mining naturally tinted clay (hydrated iron oxide) from the ground before it was washed to separate the sand from the ochre. It was then left to dry in the sun to make the natural color appear more vibrant. Sometimes it was left to burn in order to achieve a more intense shade. After the pigment had been created, it was mixed with water for smoother application. This created a stain, similar to the many lip and cheek stains that are on the market today. Egyptians applied this handmade concoction to the apples of their cheeks using a wet wooden brush. The end result was a noticeable flush that men and women admired. While appearances were certainly a factor when it came to cheek adornments, red ochre did more than just make people look good. People from this period used the pigment to protect themselves. Living in a hot and sandy climate meant their skin was often in danger due to extreme weather conditions and the harsh rays of the sun. Regular application offered both style as well as daily skin protection. Using red ochre on the cheeks was done by both the upper and lower classes. However, those with money and power typically bought manufactured cosmetics sold in marketplaces. Poorer people often made their own versions at home. Nail Care. The Egyptians used a type of henna (a dye made from leaves from the henna shrub) to paint their nails. Since the length and color was often linked to social status, upkeep was especially important. Not only did kings and members of the upper class have manicurists, people used henna to tint the nails yellow or orange. Oils and Perfumes. High importance was placed on scents and skin care. Egyptians would keep their skin smooth, hydrated, and wrinkle free by applying creams and oils made from animal fats. Fragrances were also very important as it was believed that good scents were godly. 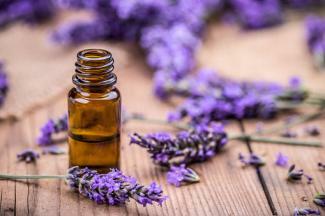 As a result, and they made scented products derived from flowers like sandalwood, lilies, iris, and frankincense. Much of our current-day makeup application is tied to the past. Just think about everything from cat eye makeup to bold red lipstick and cheek stains. All date back to ancient times! Whether you are a history buff or love to get creative with cosmetics, there is no denying Egypt's impact. Their methods continue to influence and inspire.